Which one of these items should I click? Again, the idea here is to get “upstream” to something that is closer to the actual event. One way to do that is to find the earliest post, and we’ll use that in a future task. But another way to get upstream is to get closer to the event in space. Think about it — who is more likely to get the facts of a local story correct — the local newspaper or a random blog? So as I scan the search results I’m looking at the URLs. Fox 13 News has it in “trending”. AmericaNow has it in the “society” section. But the WGME link has the story in a “news/local/” directory. This is interesting, because the other site said it happened in Oregon, and here the location is clearly Maine. But this URL pattern is a strong point in its favor. Further indications here that it might be a good source is that we see in the blurb it mentions the name of the photographer “Matthew Mills”. The URL plus the specificity of the information tell us this is the way to go. This takes me to what looks like the news page where it went viral, which embeds the original post. We see here that the downstream news report we found first had a bunch of things wrong. It wasn’t in Portland, Oregon — it was in Biddeford, which is near Portland, Maine. It hasn’t been shared “hundreds of times” — it’s been shared hundreds of thousands of times. 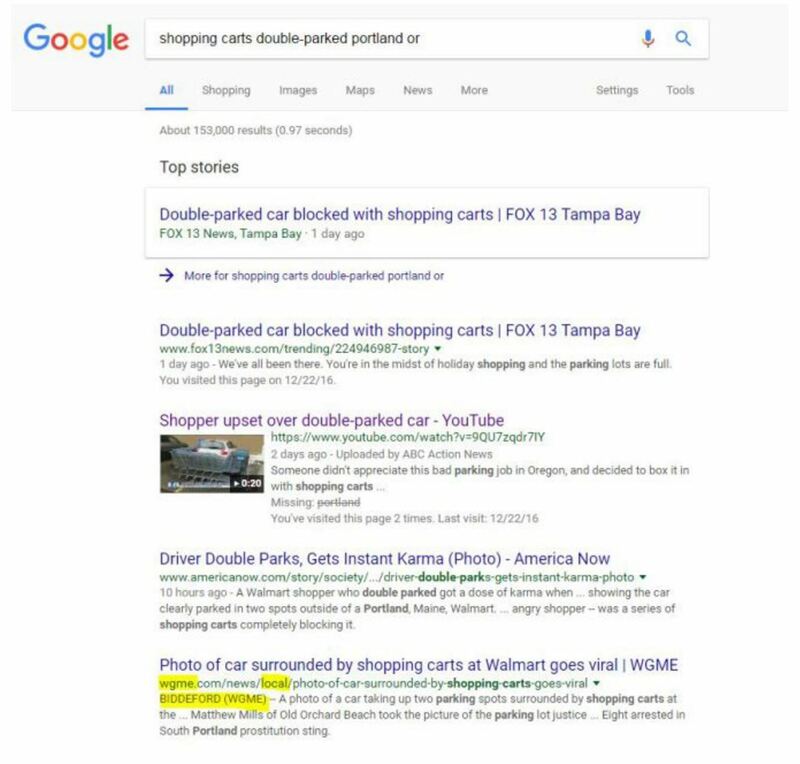 And it was made viral by a CBS affiliate, a fact that ABC Action News in Tampa doesn’t mention at all. OK, let’s go one more step. Let’s look at the Facebook page where Matthew Mills shared it. Part of what we want to see is whether is was viral before CBS picked it up or not. 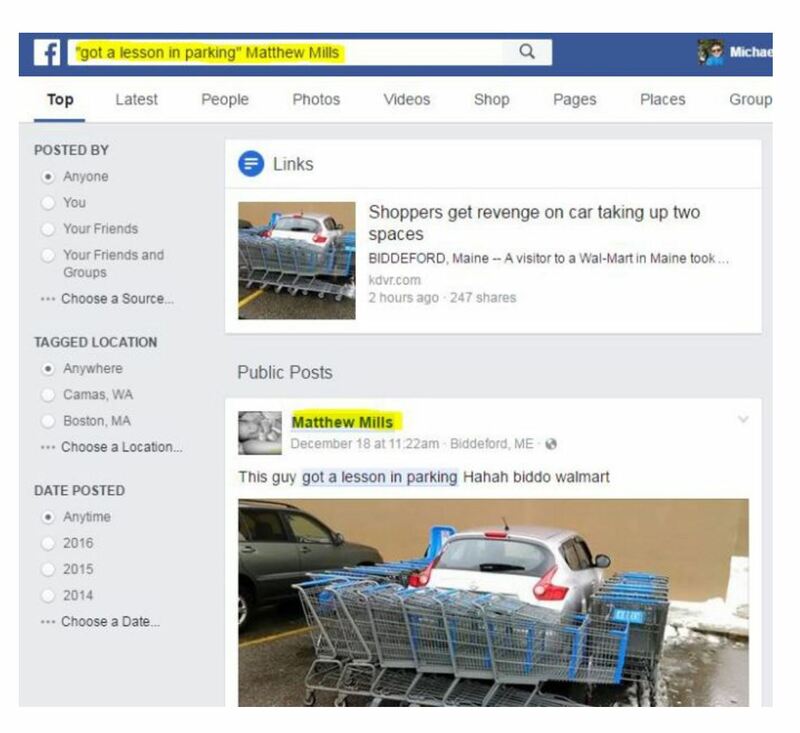 I’d also like to double check that Mills is really from the Biddeford area and see if he was responsible for the shopping carts or just happened upon this scene. And here’s where we see something unpleasant about news organizations. They cut other news organizations out of the story, every time. So they say this has been shared hundreds of times because in order to say it has been shared hundreds of thousands of times they’d have to mention it was popularized by a CBS affiliate. So they cut CBS out of the story. 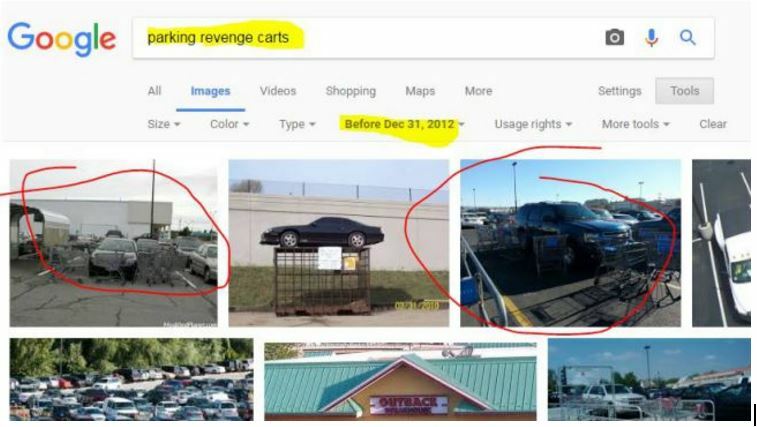 This practice can make it easier to track something down to the source. 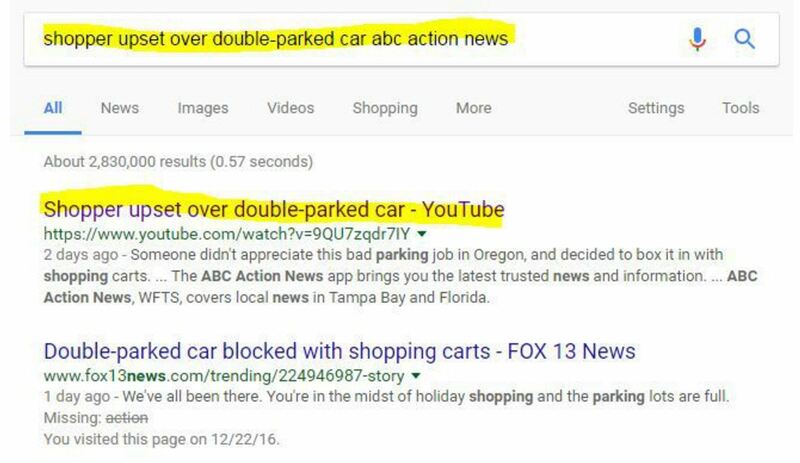 News organizations work hard to find the original source if it means they can cut other news organizations out of the picture. But it also tends to distort how virality happens. The picture here did not magically become viral — it became viral due, largely, to the reach of WGME. 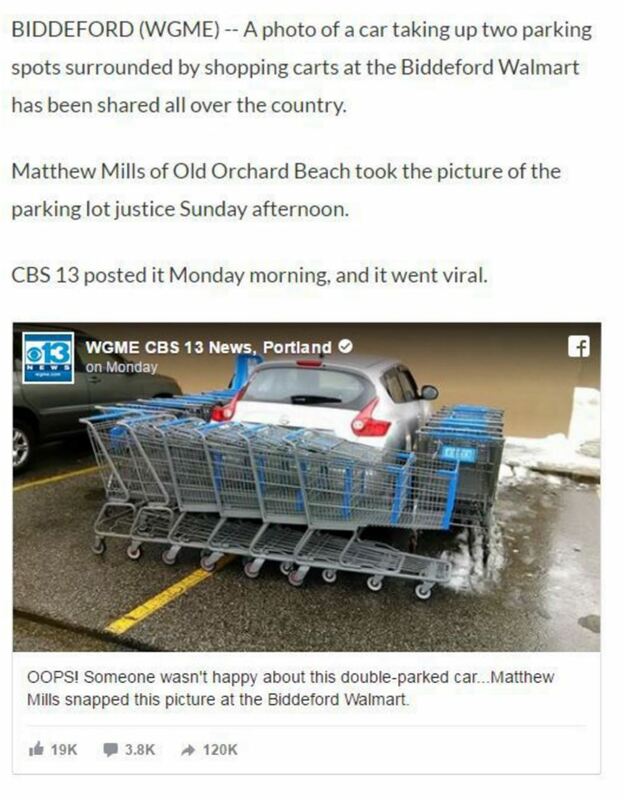 Incidentally, we also find answers to other questions in the Matthew Mills version: he took the picture but didn’t arrange the carts, and he really is from Old Orchard Beach. So that’s it. 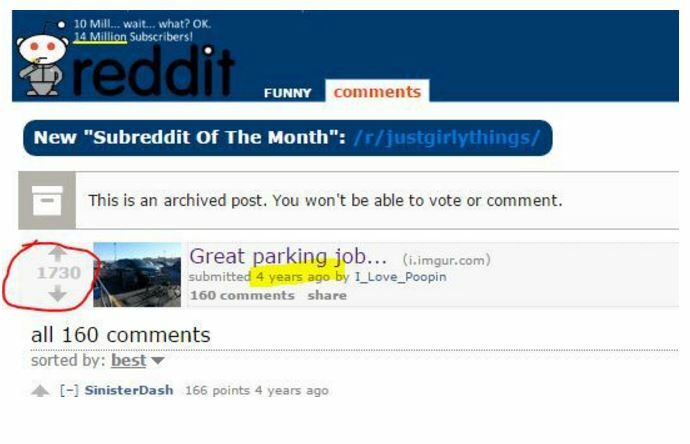 It’s part of a parking revenge meme that dates back at least four years, and popularized by Reddit. 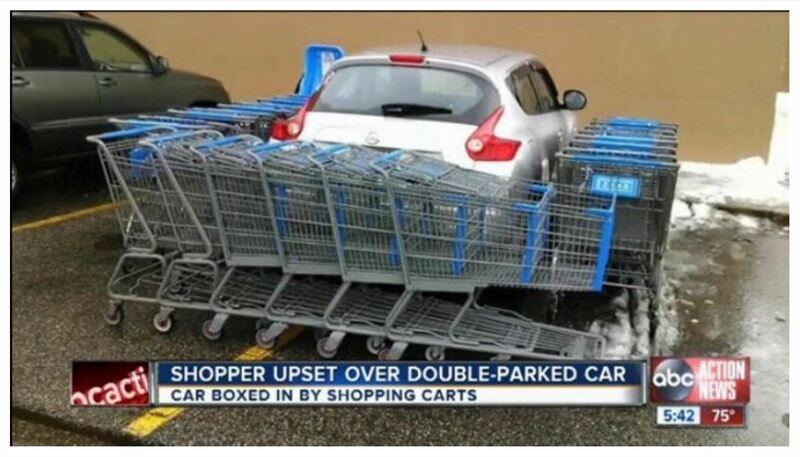 This particular one was shot by Matthew Mills in Biddeford, Maine, who was not the one who circled the carts. And it became viral through the re-share provided by a local Maine TV station. Tracking the Source of Viral Photos Copyright © 2017 by Michael A Caulfield. All Rights Reserved.